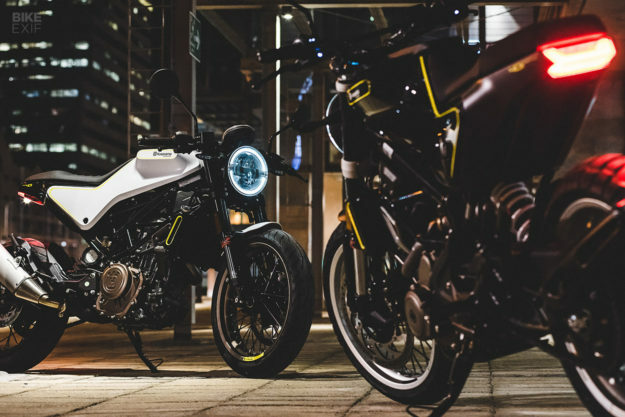 Husqvarna set the interwebs ablaze when they announced their Vitpilen and Svartpilen 401 concepts over three years ago. Then the good news came: these bikes would actually go into production. But would the factory machines be as cool as the concepts? The answer came last year at EICMA, when Husqvarna revealed the production ready 401s (and 701). It made us very, very happy: never before have we seen production motorcycles stay so true to the original designs. Now, after literally years of anticipation, we’ve finally had a chance to ride the full ‘Pilen range. Our friend Cristoph Blumberg of Craftrad magazine has already penned his thoughts on the Vitpilen 701. Now we’re taking a look the 701’s little brothers. 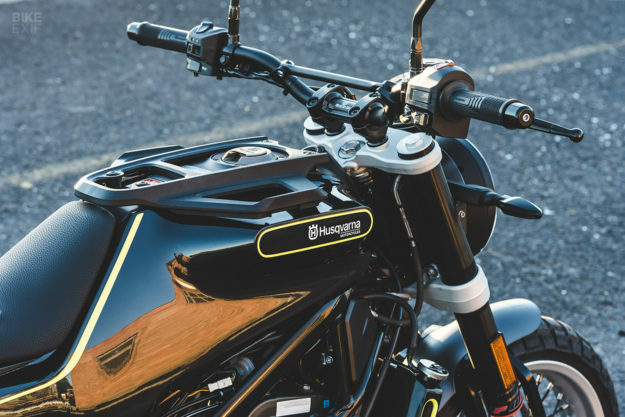 Husqvarna’s new street range references the classic Husqvarna Silverpilen, but that’s more about ideology than looks. Rather than create a ‘modern retro,’ the now-Austrian marque has made a conscious effort to build a different type of contemporary motorcycle. The new 401s feel more like one-offs from a top custom shop than factory bikes. (I can’t help but detect shades of Alex Earle’s Ducati Monster tracker.) 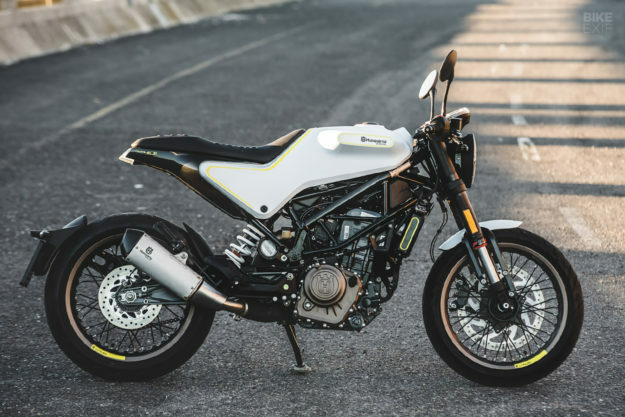 KTM and Husqvarna send all their design work to industrial design house Kiska, who’ve made their presence felt on the Husqvarna range since it was brought into the KTM fold in 2013. 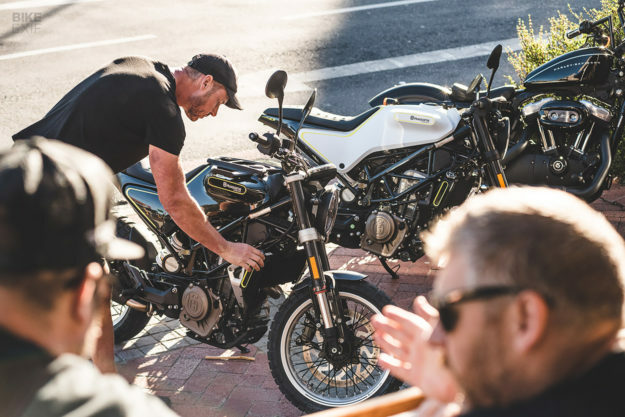 We’ve ogled photos of the Vitpilen 401 (above) and Svartpilen 401 (below) since day one, and seeing them in the flesh doesn’t disappoint. The lines are clean, the stance of both bikes is flawless, and the finishes are on point. Svart and Vit share the same bodywork; a four-piece design that hides the fuel tank and subframe, creating an almost monocoque-like effect. In fact, the two bikes are virtually identical, save for their color schemes and a handful of parts. The biggest difference is their individual riding positions, and that’s really just down to the handlebars. 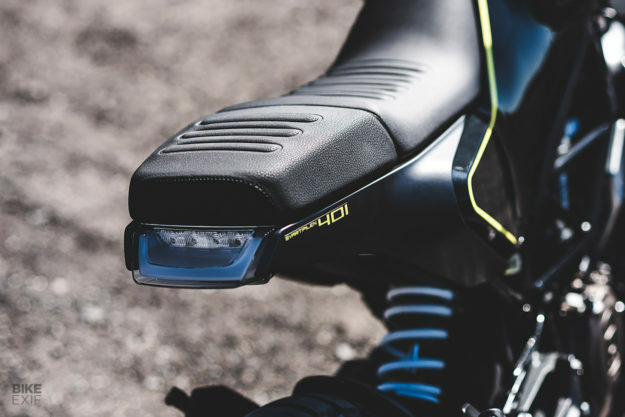 The Vitpilen has clip-ons mounted directly to its top triple clamp, while the Svartpilen gets higher scrambler-style bars. As for their foot control positions and seat heights (835 mm), those are identical. One other distinction is that the Svartpilen’s passenger seat is removable, presumably to fit an aftermarket luggage rack. It also gets a luggage rack on top of the tank, a small bash plate and a unique heat shield on the exhaust. The actual silencer is the same, it’s just finished in black on the Svartpilen, and aluminum on the Vitpilen. Both bikes share the same LED headlight, front fender and radiator. They also share the same exquisite rear light; a sharp LED unit that tucks neatly up into the tail. The only eyesore is the ‘poop scoop’ behind the rear wheel. But considering it carries the license plate and turn signals (and catches mud), without cluttering that waspish tail section, its execution is admirable. There are a couple of other things to nitpick. I dig the digital speedo’s layout and design, and it packs in way more info than you’d expect for a little bike. But the buttons (located on the side of the dial) are really fussy to use. The mirrors look like cheap replacement parts—but my money’s on those being replaced within hours of purchase. 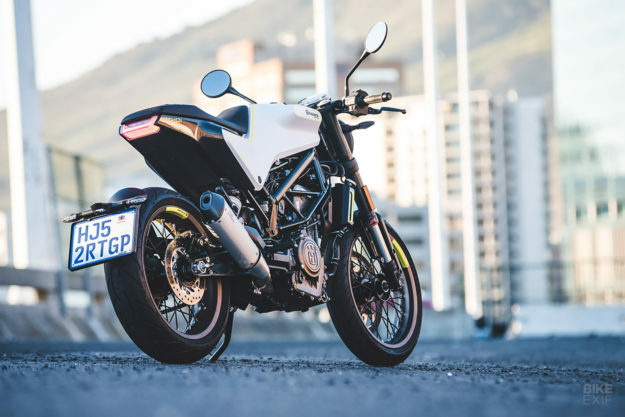 Underneath that hip exterior lurks the motor—and most of the chassis—of KTM’s super popular 390 Duke. 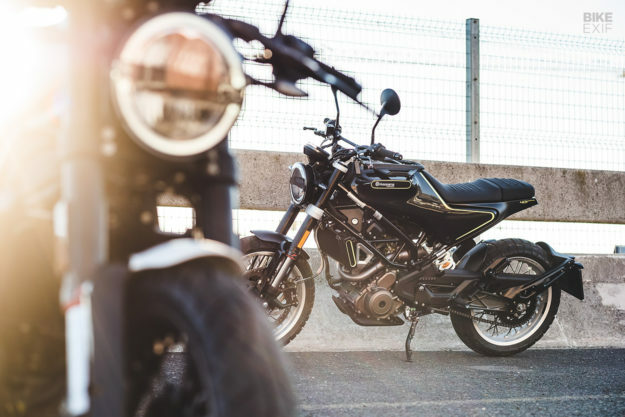 The 373 cc liquid-cooled single-cylinder motor is good for 43 hp (32 kW) and 37 Nm, and is managed by a six-speed box and an anti-hopping clutch. It also borrows the baby Duke’s killer trellis frame, and the whole package weighs a svelte 150 kg dry (330 pounds). It doesn’t get much heavier fuelled, since the tank only holds 9.5 liters (2.5 gallons). But that’s enough—the 401’s pretty frugal. Both Husky 401s get 17” wire spoked wheels. 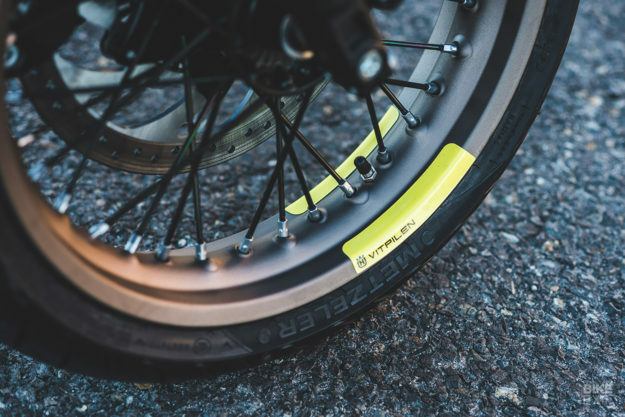 On the Vitpilen, they’re wrapped in Metzeler M5 tires; the Svartpilen gets Pirelli Scorpion Rally STRs (just like the Ducati Scrambler Desert Sled). There’s WP suspension at both ends, with 43mm upside down cartridge forks up front. Brakes are from ByBre (a division of Brembo dedicated to smaller capacity bikes), with a 230 mm disc out back and a 320 mm disc in the front. Bosch ABS is standard equipment too. The KTM 390 Duke is produced in India, but the Husky 401s are put together in Austria. I’m not usually one for debates over where a bike’s built, but the 401 undeniably oozes quality. The primary panels might be plastic, but the surface quality is right up there, with both matte and gloss finishes employed in various places to create a premium effect. Many of the other parts are metal, with carefully considered finishes and colors used throughout. Stand out bits include the matching bronzy engine covers and gas caps, and the stunning gripper pattern on each bike’s seat. Overall badging is sublimely subtle too, and the two bikes are tied together by the same yellow striping. You pay for those luxuries though. A KTM 390 Duke will cost you $5,299 in the USA, but the Vitpilen 401 and Svartpilen 401 cost a grand more, at $6,299. So these bikes are drop dead gorgeous, albeit a little pricey. But are they any good as actual motorcycles? 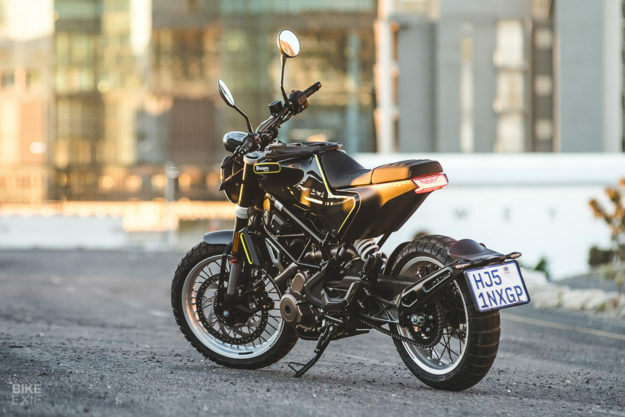 To find out, I wrangled both ‘Pilen 401s from Husqvarna South Africa. 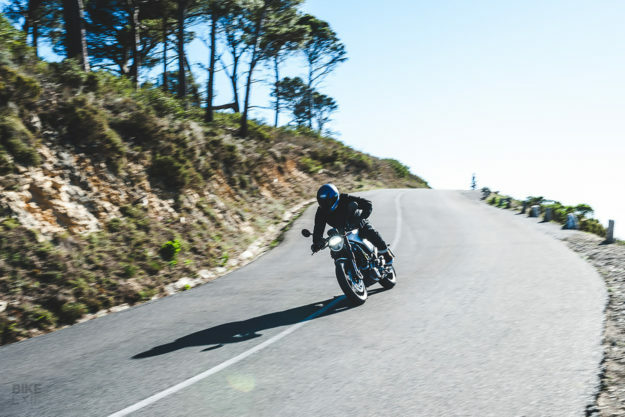 Photographer Devin Paisley and I then spent a couple of days hooning around Cape Town, regularly swapping bikes and comparing notes. When we posted a teaser from our ride to Instagram, user @timmynizzle asked: “Is it a f*ckin ripper?” I couldn’t have summed it up better: it sure is a ripper. Look, I’m a big guy. I weigh 250 lbs. before a good braai and measure in at about 6 foot tall. So I typically feel like a bear on a tricycle on smaller bikes. Even though I only just fit on the Vitpilen and Svartpilen 401, it didn’t stop either of them from being a total hoot to ride. That 373.2 cc power plant is insanely punchy, and the 401 hops off the line with the slightest encouragement. I even managed to put a little air between the front wheel and the tarmac now and then. And it had no trouble getting up to speed—and staying there—on brief highway stints either. It’s an enthusiastic little revver too, and spools up so quickly, you’ll be surprised at how soon you’ll need to shift. The response from the ride-by-wire throttle is crisp, and even though the clutch action’s a touch heavy, cycling through the gearbox is a cinch. 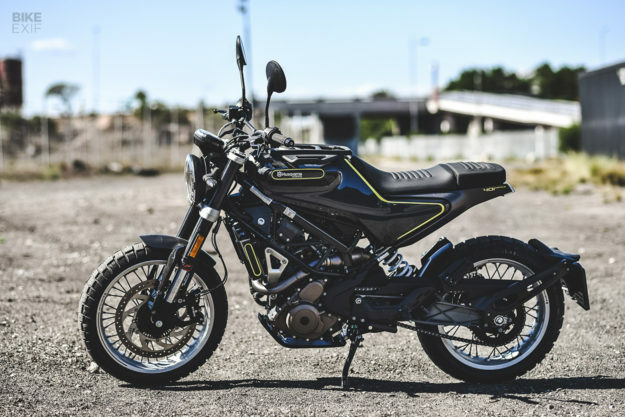 The exhaust note is just throaty enough to live with it, but I’m dying to hear the burble from the optional Akrapovič unit. The Husky’s WP suspension holds the road well, but it’s very soft under a big guy like me, and it’s not adjustable. That’s really to be expected at this price point—but what really impressed me was how well the ABS-equipped brakes performed. Then there’s the 401’s ergonomics. 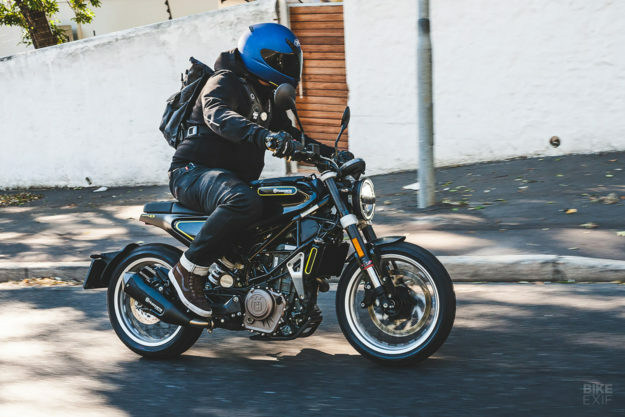 Both the Svartpilen and Vitpilen are roomier than they look, and I felt less squished on them than I have on some bigger bikes. The seats are not built for distance though, and I was walking funny after a long day in the saddle. As for passenger accommodations, if your pillion is any larger than my nine-year-old son, neither of you is going to be particularly comfortable. The bikes also feel significantly different to ride. 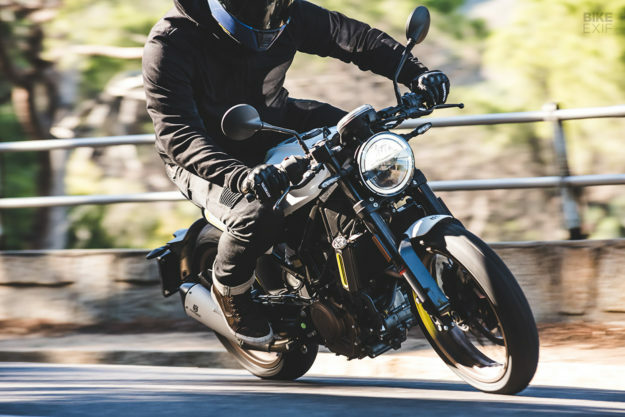 I was pleasantly surprised that the Vitpilen’s café racer riding position didn’t completely slaughter me; it did put a little strain on my wrists and back, but it was far less strenuous than I thought it would be. The Svarpilen is my favorite by a country mile. Its upright, street tracker riding position is not only more comfortable than the Vitplien, but it makes the bike easier to manhandle too. It could be that I just prefer that style of riding, but to me the Svartpilen 401 feels like a BMX with a motor. Those Pirelli Scorpion Rally STRs do a pretty good job of sticking to both tarmac and gravel, but you won’t be spending too much time on the latter. 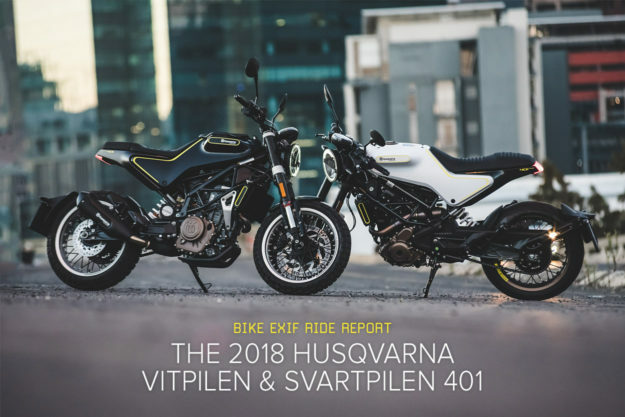 I’d happily take Svartpilen on short jaunts on well-graded fire roads, but the overall package is still far too street biased for serious off-roading. 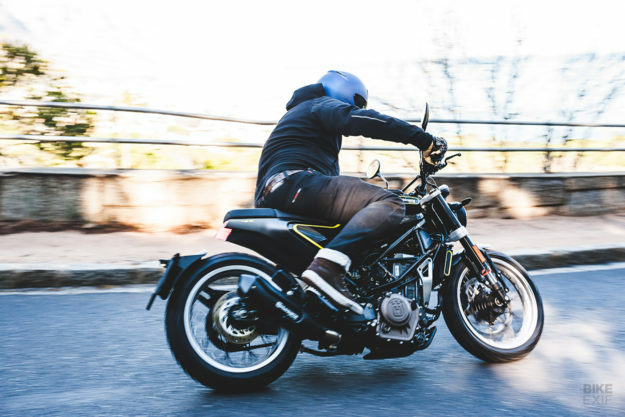 Both 401s are pure hooliganism in two-wheeled form. Devin and I chased each other through twisties and crappy inner city traffic, took shortcuts, hopped curbs and just generally misbehaved all day long. Naturally every time we stopped, the Vitpilen and Svartpilen attracted legions of admirers. 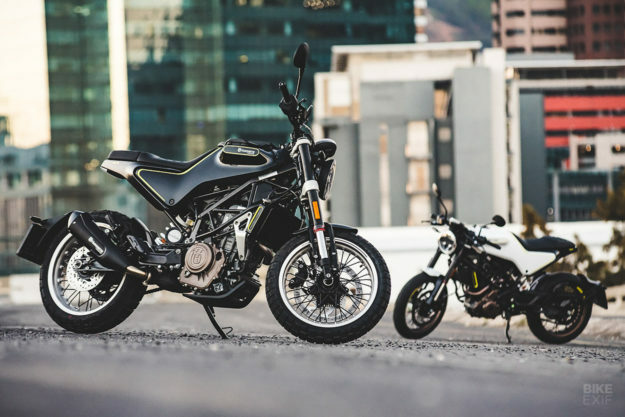 And that’s really the appeal: Husqvarna has a built a pair of stylish whips that will appeal to more than just motorcyclists. 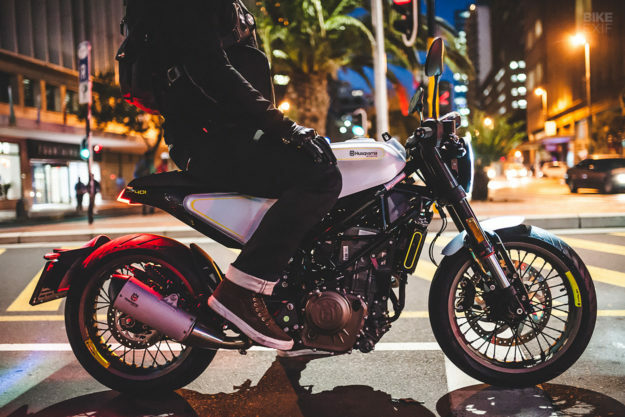 In a market where people see motorcycles as more of a lifestyle accessory than a lifestyle, that’s a good thing. It’ll be interesting to see how the custom scene gets along with the ‘Pilen siblings. They’re so minimal out the box that there’s not much left to take away. And they look so good, you don’t really want to change anything. I have a few ideas of what I’d do if I had a Svartpilen 401 in my garage, but most of it’s centered around performance upgrades. And I’d need to stop riding it for long enough to actually wrench on it. Parked up, the Vitpilen 401 and Svartpilen 401 are striking designs and a fresh perspective on modern motorcycling. On the move, they’re a pair of pint-sized weapons that punch far above their weight. These two get the EXIF seal of approval. 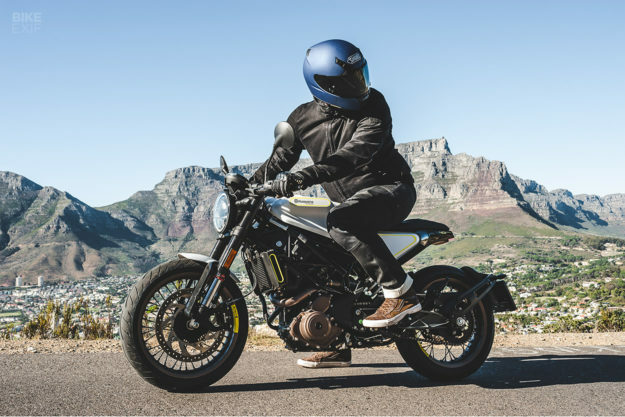 Husqvarna Motorcycles | Facebook | Instagram | Images by Devin Paisley | With thanks to Husqvarna South Africa and Husqvarna Cape Town.